There are several features that set the Carlisle StorPlus EZ Access Hinged Lids apart. First, they have clear, NSF certified lids that feature a larger opening than similar lids. The lids can come with one, two or no notches. The flat interior space makes it extremely easy for end users to portion scoops out of the pans. Clear StorPlus EZ Access Hinged Lids offers convenient, hands-free operation by allowing people to serve themselves without having to hold the lid open. 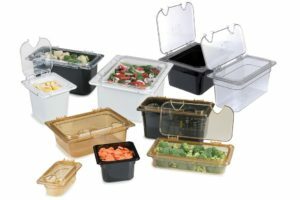 Prevent cross-contamination and retain food freshness. Peg hole and a handle for easy gripping, cleaning, and drying. Polycarbonate withstands tough use and is resists food acids and oils.